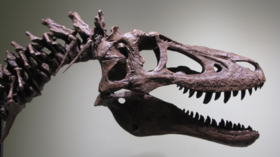 The rare fossilized skeleton was uncovered in Montana in 2013 and has been on loan to the University of Kansas Natural History Museum where it was on display until this week, when the exhibition was pulled after it learned that the dinosaur’s owner had listed it on eBay. The museum posted a statement on Twitter distancing itself from the entire enterprise. I will soon be removing my 68 million year old 4 year old T-Rex from the Museum for Good. God Bless America, The Land of the Free and the Home of the Brave. Where Capitalism is King and Socialism is Scorned. Museum director Leonard Krishtalka explained they took issue with how “abruptly” Detrich put the dinosaur on eBay and how the listing made it appear that the university was promoting the sale, and that it falsely claimed a KU researcher was writing a paper on the fossil for a journal. Detrich also tweeted about his previous dinosaur sales, saying he sold an adult T. rex skeleton he found in South Dakota in 1992 and named ‘Samson’ for over $8 million in 2001. Just been informed that there&apos;s a juvenile T. rex, for sale on Ebay?Apparently it&apos;s currently on display at the University of Kansas Museum of Natural History &apos;where it is being studied and will soon be published&apos;. Published on Wed, 17 Apr 2019 17:01:36 GMT, © All rights reserved by the publisher.